On Wednesday 6th March, 2019, AustCham Thailand held its Annual General Meeting and elected the 2019/20 Board of Directors. Pictured from left (back row) are: Mr. Simon Wetherell (SW Consulting Asia), Mr. Chris McLoughlin (NS Bluescope Lysaght), Ex-officio Director Ms. Susan Kahwati (Austrade), Mr. Frank Holzer (ANCA Sheet Metal Solutions), Mr. Stuart Kelly (Weber Shandwick), Mr. James Evans (Linfox International Group), Treasurer Mr. Peter Emblin (Aldama Foods); from left (seated) Mr. Brenton Mauriello (dwp), Vice President Mr. Benjamin Krieg (Novotel Bangkok Sukhumvit 20), President Mr. Wayne Williams (Minor Hotel Group), Vice President M.L. Laksasubha Kridakon (Baan Laksasubha Resort Hua Hin), Vice President Mr. Christopher Larkin (CLC Asia), Ms. Apiradee Bunyalekha (Asiania International Consulting). Thank you to all those who nominated and all members who attended the AGM. Your input and time in participating is highly appreciated. See you all again at Episode Four of the Digital Workshop Series on “Understanding Analytics”, Wednesday 22 May, 8.30-10.30. More details soon. On Tuesday 19 March, AustCham Thailand, in collaboration with joint chambers, held a Business Luncheon with special guest speaker Khun Arin Jira, Chairman of ASEAN-BAC Thailand on “Thailand’s Economic Goals as ASEAN Chair”. We would like to express our gratitude to Khun Arin for taking his time to share knowledge about the four pillars for “Empowering ASEAN 4.0”. Members and guests also got a chance to raise their questions regarding the future of ASEAN in relation to their business field. 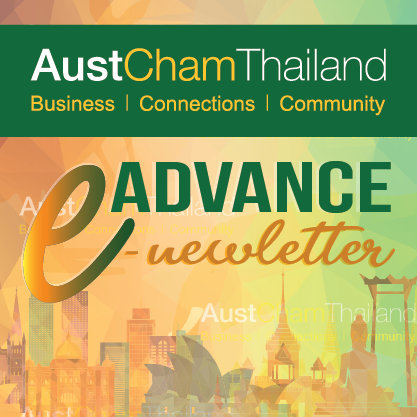 On Friday 15 March 2019, AustCham Thailand, in collaboration with partner chambers, held AustCham’s Eastern Seaboard Sundowners at MYTT Beach Hotel, located in the heart of North Pattaya. It was our pleasure to see members and guests enjoying a delicious choice of local and international dishes and friendly atmosphere at the new rooftop bar of the hotel. Additionally, prior to the Sundowners, there was also an ESB Briefing on “Innovation Motorsport” where two Australian racing identities, Mike Freeman and Ross Holder shared their full story of how they created a new racing powerhouse in Thailand. We would like to thank our corporate sponsor, Bangkok Hospital Pattaya, and our venue sponsor, MYTT Beach Hotel, for making these events successful. On Friday 8th March 2019, AustCham Thailand, in collaboration with partner chambers, held a Joint Phuket Sundowners at Angsana Laguna Phuket. Surrounded by a beautiful sunset view along Bang Tao beach, the guests enjoyed networking whilst indulging in a delicious Aussie-inspired menu. Prior to the Networking, we also organized a Member Briefing on “Doing Business in ASEAN: What does it really mean?”. Thanks to our panelists, Andy Coop; Regional Commercial Director, Linfox International Group (Thailand); Aga Manhao; CEO, Home Stay Care, & Founder, Futuris Solutions (Singapore) and Stephen Higgins; Managing Partner, Mekong Strategic Partners (Cambodia) for taking their time to share their thought from geographically different angles of business. Finally, we would like to thank our corporate sponsor, Minor Food Group International Franchise; our venue sponsor, Angsana Laguna Phuket; our all-time favorite event supporter, Lady Pie Phuket; and our local media partner, Phuket News, for making these events successful.